Location: Kassandra, Halkidiki, Greece. Flights to Thessaloniki airport from which the Sani Resort is approximately 75 KM. 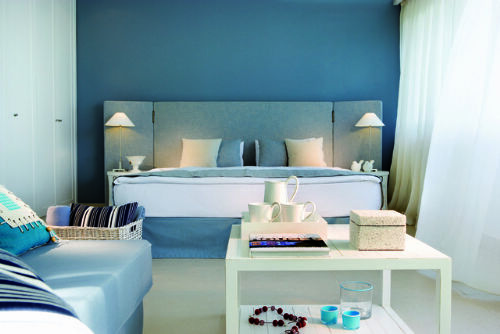 Description: Double rooms at the Sani Beach Club are in bungalow blocks offering contemporary design and comfort. Floor-to-ceiling windows overlooking the magnificent Aegean Sea and Mount Olympus or the lavish gardens. Mini-bar, coffee and tea making facilities, espresso machine, bottle of wine and fruit plate upon arrival, bathrobes, slippers, hairdryer, international direct-dial telephone, multi-channel satelite flat screen television and integrated music channels, DVD / CD player, safety box (complimentary), air-conditioning / heating (individually adjustable per room). Spacious bathroom with make up mirror and bathtub with tropical shower. Terrace with rattan table and two chairs. Bathroom amenities by Morabito. Tile Floor, indoor space approx 34m2. The Dine-Around programme allows full-board guests to enjoy their meals at many restaurants throughout Sani Resort. Guests may use their meal allowance in ten a-la-carte restaurants, where they can either select one of the several tailored menus - without extra charges - or order a-la-carte. If guests choose to order a-la-carte, the meal allowance amount of 20€ p.p. (children 10€) for Sani Beach Club guests, will be deducted from your total resort bill. Occupancy: The price shown here is based on 2 Adults and 1 Child under 12 yrs sharing a Double Deluxe Room private garden with a garden view including Half Board. Occupancy: The price shown here is based on 2 Adults and 1 Child under 12 yrs sharing a Double Deluxe Room private garden and sea view with Half Board. Occupancy: The price shown here is based on 2 Adults sharing a Double Deluxe Room private garden and sea view with Half Board. Occupancy: The price shown here is based on 1 Adult in a Double Deluxe Room Garden View with Half Board. Up to 2 children aged 11yrs and under may also stay in this room at this price (one on guest bed). Occupancy: The price shown here is based on 1 Adult in a Double Deluxe Room upper floor and sea view with Half Board. Up to 2 children aged 11yrs and under may also stay in this room at this price (one on guest bed). Occupancy: The price shown here is based on 2 Adults and 1 Child under 12 yrs sharing a Double Deluxe Room upper floor and sea view with Half Board. Double rooms can accommodate up to 3 people; a maximum of 3 adults, or 2 adults and 1 child up to the age of 12. 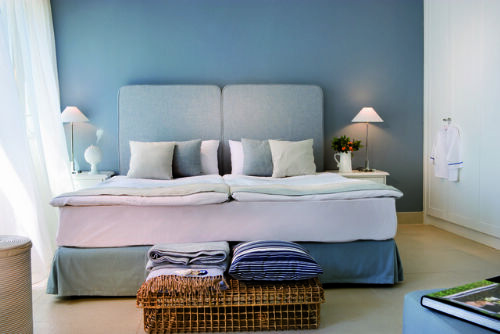 The 3rd adult incurs a supplement and is accommodated on a guest bed in the room as would be the child. Occupancy: The price shown here is based on 2 Adults sharing a Double Deluxe Room upper floor and sea view with Half Board. Resort was extremely well run, staff fantastic. Overall though the resort lacked any real atmosphere. Occupancy: The price shown here is based on 3 Adults sharing a Double Deluxe Room upper floor and sea view with Half Board. 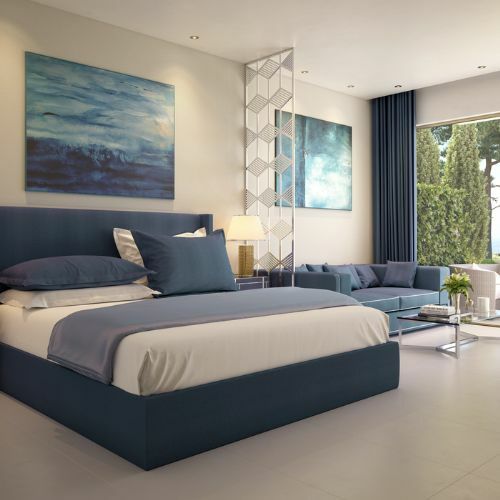 Description: Double rooms at the Sani Beach Club are spacious rooms in block bungalows with floor to ceiling windows providing beautiful views over the Aegean or lavish gardens. All ground floor double rooms have terrace while the upper floor rooms have balcony. Double rooms can accommodate up to 3 people; a maximum of 3 adults, or 2 adults and 1 child up to the age of 12. Extra amenities: Bottle of wine and fruit basket upon arrival, Tile floor with a spacious bathroom with make up mirror and bathtub with tropical shower. Balcony with rattan table and two chairs. Bathroom amenities by Morabito. Tile floor, indoor space approx 68m2. The Dine-Around programme allows full-board guests to enjoy their meals at many restaurants throughout Sani Resort. Guests may use their meal allowance in ten a-la-carte restaurants where they can either select one of the tailored menus - without extra charges - or order a-la-carte. If guests choose to order a-la-carte, the meal allowance amount of 20€ pp (children 10€) for Sani Beach Club guests, will be deducted from your total resort bill. Occupancy: The price shown here is based on 2 Adults plus 2 Children under 12 yrs sharing a Family Suite Grand Balcony Sea View with Half Board. 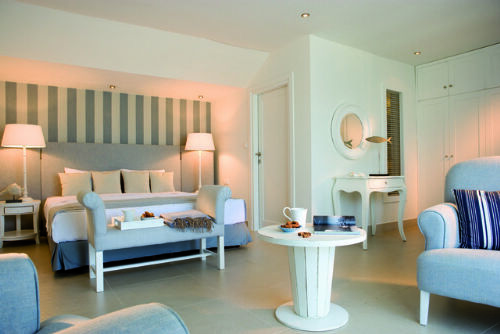 Description: Double rooms at the Sani Beach Club are spacious rooms in block bungalows with floor to ceiling windows providing beautiful views over the Aegean or lavish gardens. All ground floor double rooms have terrace while the upper floor rooms have balcony. Double rooms can accommodate up to 3 people; a maximum of 3 adults, or 2 adults and 1 child up to the age of 12. Extra amenities: Bottle of wine and fruit basket upon arrival, Tile floor with a spacious bathroom with make up mirror and bathtub with tropical shower. Balcony with rattan table and two chairs. Bathroom amenities by Morabito. Tile floor, indoor space approx 68m2. The Dine-Around programme allows full-board guests to enjoy their meals at many restaurants throughout Sani Resort. Guests may use their meal allowance in ten a-la-carte restaurants, where they can either select one of the several menus - without extra charges - or order a-la-carte. If guests choose to order a-la-carte, the meal allowance amount of 20€ p.p. (children 10€) for Sani Beach Club guests, will be deducted from your total resort bill. Occupancy: The price shown here is based on 2 Adults plus 3 Children under 12 yrs sharing a Family Suite Grand Balcony Sea View with Half Board. Description: Junior Suites offer contemporary design and comfort. Seating area, floor to ceiling windows are overlooking the magnificent Aegean Sea and Mount Olympus. Mini bar, coffee and tea making facilities, espresso machine, bottle of wine, water and fruit plate upon arrival, afternoon turn down service, bathrobes and slippers, hairdryer. International direct-dial telephone, multi-channel satelite flat screen television and integrated music channels, DVD / CD player, safe (complimentary), air-conditioning / heating (individually adjustable per room). Spacious bathroom with make up mirror, twin wash basins, bathtub with hydro-massage and separate tropical shower cabin. Exclusive bathroom amenities by Anne Semonin. Terrace with rattan table and two chairs and two sun loungers in private garden. Tile floor. Indoor space approx 37m2. The Dine-Around programme allows full-board guests to enjoy their meals at many restaurants throughout Sani Resort. Guests may use their meal allowance in ten a-la-carte restaurants, where they can either select one of the several tailored menus - without extra charges - or order a-la-carte. If guests choose to order a-la-carte, the meal allowance amount of 20€ p.p. (children 10€) for Sani Beach Club guests, will be deducted from your total resort bill. Occupancy: The price shown here is based on 2 Adults and up to 2 Children under 12 yrs sharing a Junior Suite with private garden Half Board. Occupancy: The price shown here is based on 2 Adults and 2 Children under 12 yrs sharing a Junior Suite with private garden Half Board. Sani Beach club provide an excellent friendly service in a relaxed atmosphere. Fantastic food, lovely staff and a great location. We hope to come back another year. Occupancy: The price shown here is based on 3 Adults sharing a Junior Suite with private garden Half Board. Occupancy: The price shown here is based on 2 Adults and 1 Child under 12 yrs sharing a Junior Suite with private garden Half Board. Description: One Bedroom Family Suites are spacious family suites offer the highest level of luxury and privacy to larger families with a separate bedroom, private living room and bathroom with luxury bathroom toiletries by Anne Semonin, coffee and tea making facilities, Nespresso machine, mini bar, Dream Beds and pillow selection for extra comfort, international direct-dial telephone, 2 flat screen televisions with satellite multi-channel and integrated music channels, DVD / CD player, complimentary wireless internet access, a private garden and their own extensive outdoor pools complete with luxury garden furniture and just a short walk from the hotel’s beach (indoor space approx. 100 m2, exterior areas 140 m2).The Dine-Around programme allows full-board guests to enjoy their meals at many restaurants throughout Sani Resort. Guests may use their meal allowance in ten a-la-carte restaurants, where they can either select one of the several tailored menus - without extra charges - or order a-la-carte. If guests choose to order a-la-carte, the meal allowance amount of 20€ p.p. (children 10€) for Sani Beach Club guests, will be deducted from your total resort bill. Occupancy: The price shown here is based on 2 Adults OR 2 Adults and 2 Children under 12 yrs sharing a One Bedroom Family Suite with private garden and pool view Half Board. Occupancy: The price shown here is based on 2 Adults and 2 Children under 12 yrs sharing a One Bedroom Family Suite with private pool and sea view Half Board. Description: Two Bedroom Family Suites are new for 2016. Exceptionally spacious family suites offer the highest level of luxury and privacy to larger families with two separate bedrooms, private living room and two bathrooms with luxury bathroom toiletries by Anne Semonin, coffee and tea making facilities, Nespresso machine, mini bar, Dream Beds and pillow selection for extra comfort, international direct-dial telephone, 3 flat screen televisions with satellite multi-channel and integrated music channels, DVD / CD player, complimentary wireless internet access, a private garden and their own extensive outdoor pools complete with luxury garden furniture and just a short walk from the hotel’s beach (indoor space approx. 120 m2, exterior areas 170 m2).The Dine-Around programme allows full-board guests to enjoy their meals at many restaurants throughout Sani Resort. Guests may use their meal allowance in ten a-la-carte restaurants, where they can either select one of the several tailored menus - without extra charges - or order a-la-carte. If guests choose to order a-la-carte, the meal allowance amount of 20€ p.p. (children 10€) for Sani Beach Club guests, will be deducted from your total resort bill. Occupancy: The price shown here is based on 3 Adults sharing a Two Bedroom Family Suite with private garden and sea view Half Board. Occupancy: The price shown here is based on 2 Adults and 2 Children under 12 yrs sharing a Two Bedroom Family Suite with private garden and sea view Half Board. Occupancy: The price shown here is based on 2 Adults and 3 Children under 12 yrs sharing a Two Bedroom Family Suite with private garden and sea view Half Board. Occupancy: The price shown here is based on 3 Adults and 1 Child under 12 yrs sharing a Two Bedroom Family Suite with private garden and sea view Half Board. Occupancy: The price shown here is based on 4 Adults sharing a Two Bedroom Family Suite with private garden and sea view Half Board. Occupancy: The price shown here is based on 2 Adults and 2 Children under 12 yrs sharing a Two Bedroom Family Suite with private pool and sea view Half Board. Occupancy: The price shown here is based on 2 Adults and 3 Children under 12 yrs sharing a Two Bedroom Family Suite with private pool and sea view Half Board. Occupancy: The price shown here is based on 3 Adults and 1 Child under 12 yrs sharing a Two Bedroom Family Suite with private pool and sea view Half Board. Occupancy: The price shown here is based on 4 Adults sharing a Two Bedroom Family Suite with private pool and sea view Half Board.